The Barryvox VS 2000 Pro Ext is almost identical to the VS 2000 Pro, but it has three major distinctions. First, the Ext (which stands for external) is an avalanche receiver, but not a transmitter. 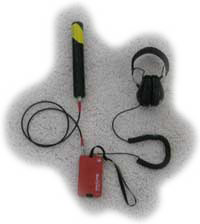 This unit is used strictly for searching by professional rescuers. Second, the Ext comes with a massive, external antenna. The antenna, which is almost a foot long and 1-1/2 inches in diameter, gives the Ext tremendous range. Third, the Ext includes a high-quality pair of Peltor headphones to help you hear the signal. The Ext's true strength is its long range. A rescuer can stand at the top of an avalanche field and search a huge area. I've frequently worked with a special "long-range" version of the Ext which can be lowered out of a helicopter. 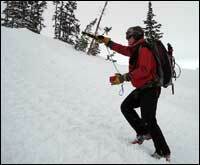 This allows us to search avalanche debris for a possible burial without exposing rescuers to the avalanche hazard. The Ext requires two hands to operate (one to hold the receiver and adjust the sensitivity and the other to aim the antenna). Because it is intended to be used with the headphones, it can't be used with a helmet. Given the unique design of the Ext, it isn't really fair to rate it using the five-star approach. If you want to know if an avalanche transceiver is transmitting, the Ext can't be beat and deserves five stars. If you want to search for a buried transceiver, the Ext probably deserves two stars due to the lack of a directional or distance indicators (although a skilled rescuer can quickly locate a victim using the handheld antenna). If you want to carry a transceiver with you when you are backcountry skiing, this isn't it. Pros: Long range for professional rescuers. Cons: Receiver only (not a transceiver).